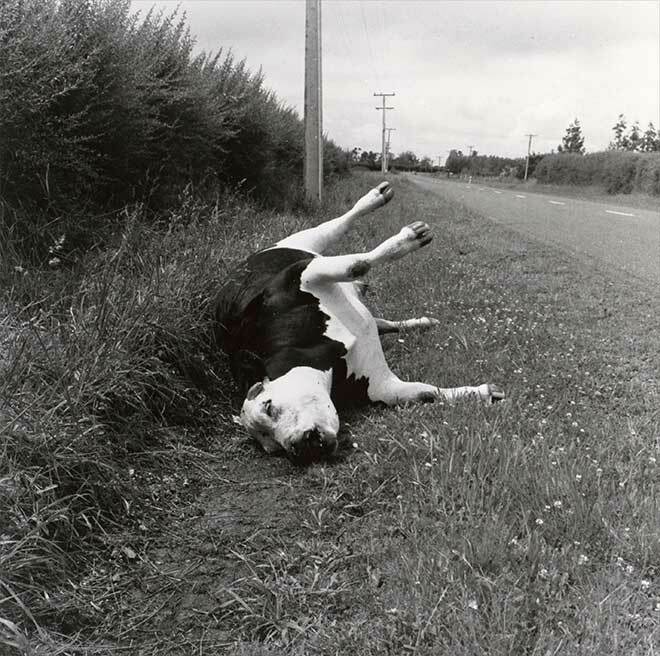 This image, by New Zealand photographer Peter Peryer, of a dead cow lying by the roadside, ears chewed, flies buzzing around, was used to advertise his 1996 exhibition in Frankfurt. Many of those who saw it thought it a political metaphor, a reference to mad cow disease which had spread to people who had eaten meat from infected animals. New Zealand Minister of Agriculture John Falloon was greatly concerned, attempting to have the exhibition closed or the photograph removed, and instructing the New Zealand High Commissioner, who was to have opened a second showing of the exhibition in another German city, to withdraw from the event.